* File with Australian/UK Spelling and mathematical terminology now included. 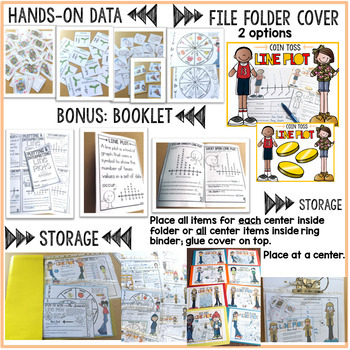 This 62 page comprehensive unit on Line Plots covers all key Mathematical concepts and strategies to collate and display data in fractions of a unit using interactive materials like visual cards, dice, spinners and real-life data. This is a basic starter activity. A six-sided die is rolled 15 times and numbers recorded on a line plot. Students work with a Line Plot mat and a task card to interpret data collected and recorded. This activity involves working with fractions of a unit to solve addition and subtraction problems. A scenario task sheet, fraction cards and task card target recording and plotting of data on a Line Plot. A spinner denoting fractions of a unit is spun 15 times and data collected is recorded in a Line Plot. A task card features interpreting data on the Line Plot and solving problems relating to addition and subtraction. Students make their own fraction cube from given template and roll it 10 times. Data is recorded on a Line Plot. A task card is used to interpret data collected and recorded. 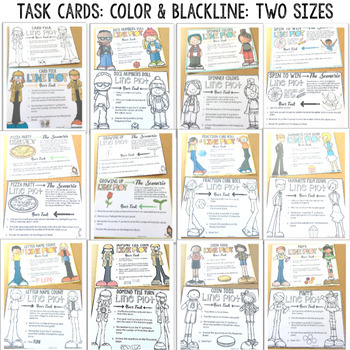 Growth chart task cards are used to solve the problem outlined in the scenario sheet. Data is collected from each task card and recorded on a Line Plot. Students solve problems relating to addition and Subtraction of fractions of a unit outlined in task sheet. Some Line Plots have no scale drawn to provide further challenge. 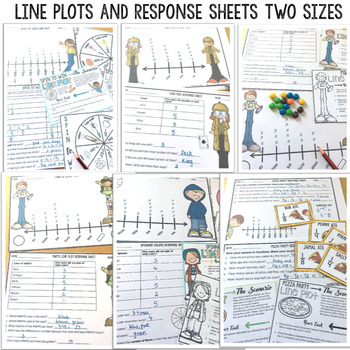 Each Line Plot activity is followed by a sample answer sheet. * Lucky Spin Line Plot. → Two task cards requiring interpretation of data will be printed on a single sheet. 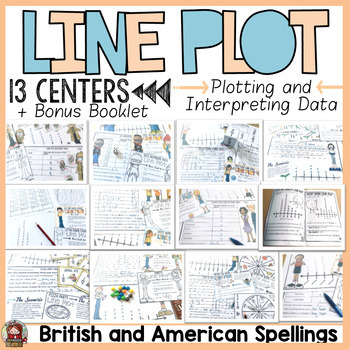 There are also flashcards that feature key vocabulary used when working with line plots. I use this unit in group rotations. Whole-class teaching of general concepts is administered and work on graphs in this unit is rotated among four groups comprising of 4-5 students to reinforce skills. Each student works on 2-3 graphs depending upon pace and ability. There are also extra graphs for the early finishers. Alternatively, these graphing activities could also be used in Math Centers. This pack is part of the 'Line Plots and Line Graphs Ultimate' collection.